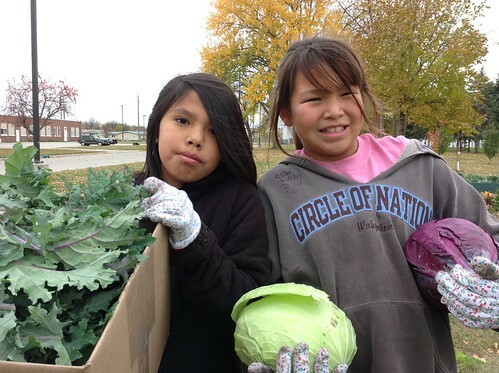 Students at Circle of Nations School gathered vegetables that they grew in the school’s garden. They used the kale and cabbage in a “Healthy Choices” cooking class. In November, USDA pays tribute to the rich ancestry and traditions of Native Americans by observing Native American Heritage Month. Today, an important part of Native American culture includes working towards a healthier lifestyle for Native American people. The following guest blog demonstrates the wide range of efforts that tribes are making to support a healthier next generation. We thank the Circle of Nations School for sharing their story. Circle of Nations School (CNS) is an inter-tribal off-reservation boarding school in Wahpeton, N.D., chartered under the Sisseton-Wahpeton Dakota Oyate and funded by the Bureau of Indian Education. CNS serves American Indian youth in grades 4 through 8. CNS is a 2012 recipient of the HealthierUS School Challenge Gold Award, a Green Ribbon School Award, and of the Carol M. White Physical Education Program (PEP) grant. CNS was the first Green Ribbon School in the state of North Dakota and the entire Bureau of Indian Education system. These and related initiatives promote healthy environment, physical activity and nutritional improvement points including fresh, locally sourced food. CNS was invited to the White House anniversary celebration panel for Let’s Move in Indian Country. At the event, a sponsor was found for our application to Let’s Move Salad Bars to Schools. Thanks to Whole Kids Foundation, we are able to offer soup and salad bar twice a day along with meals using produce from our school kitchen garden such as corn, kale, cabbage, coleslaw, cucumbers, peppers, carrots, beans, green and red salsa, squash, pumpkins, potatoes, tomatoes, onions, apples, berries, and melons. With its Farm to School (FTS) partner Intertribal Buffalo Council (ITBC), CNS was selected for the first ever Native Cohort at 2014 National Farm to Cafeteria Conference. ITBC has a membership of 58 tribes in 19 states with a mission to re-establish buffalo herds on Indian lands to “promote cultural enhancement, spiritual revitalization, ecological restoration, and economic development.” ITBC is working with several schools to incorporate buffalo meat into their foodservice programs with a goal to help our younger generation become healthier. CNS is photo-featured in their publication viewable at http://www.votebison.org/pdf/ITBC-School-Lunch-Newsletter.pdf. National FTS Network voted CNS its pick for North Dakota $750 grant winner to celebrate FTS Month in October. CNS is procuring Native-harvested wild rice and buffalo meat for a traditional food cooking class and ceremonies. CNS is growing heirloom Native seed varieties such as Dakota corn as well to be used in the soup for ceremonies. FTS Month kickoff started with Pride of Dakota School Lunch Day (Local Foods) and community Soup Walk 5K in partnership with Southern Valley Health Watch. This was a service learning project to raise awareness of hunger and poverty issues and raise donations to the local food pantry. CNS Running Warriors Club helped harvest and prepare traditional buffalo, corn and wild rice soup as well as garden minestrone soup for the community bread and soup line meal. CNS donated prizes for the drawings including “Bears Make Rock Soup” by staffer Lise Erdrich, illustrated by Lisa Fifield. Throughout the month of October, the PEP “Healthy Choices” cooking classes continued “Random Acts of Soup” around the school campus and community, delivering gallons of soup to the dorms, facilities, school lunch program, sweat lodge and elderly friends. ITBC staff Dianne Amiotte-Seidel traveled to CNS with a culture and nutrition education “Buffalo Box” presentation for two days in Mr. Jungling’s health classes. Garden activities including Potato Awareness Week were conducted along with cooking classes to make garden rainbow pizzas and “Bake it Healthier” goodies using our locally harvested apples, pumpkins and locally sunflower seeds. A “Healthier School Fundraiser” was held featuring homemade whole-grain bread, garden soup and bake sale goodies. The funds were used to sponsor a Soldier Wolf Poetry Out Loud 5k and lyceum with special guest Shivalo Soldier Wolf, a senior at Flandreau Indian School who is the 2014 state Poetry Out Loud champion for South Dakota who made it top 12 nationally from a field of over 365,000 competitors. Students had the option to stop at Hydration recitation Station where judges from NDSU National/Red River Valley Writing Project awarded 23 efforts. NDSU also contributed the event T shirts while Three Rivers Arts Council contributed trophies and ribbons. I love these children! What an awesome program with so much dedication and purpose. The Healthy Lifestyles activities at CNS are inspiring. My small rural school wrote a grant, planted a garden, and infused gardening into every area of curriculum K12. Lise's work was foundational for us and we appreciate her passion for nature and children.